It's party time again! Hope you had a great week since our last gathering. I went to the Haven conference in Atlanta, which is just down the road from me, and had a grand time connecting and hanging with my friends. It was fun seeing old friends and making new ones. I wasn't going to go this year, but am so glad I did. I barely took a picture so there will not be a post about Haven. Lots of great links last week and here are a few features. Pat and her hubby from Back Porch Musings downsized a few months ago and I look forward to each room reveal. Check out her cozy den. This is a remarkable makeover by My So Called DIY Blog. I hope you check out how she achieved this look. 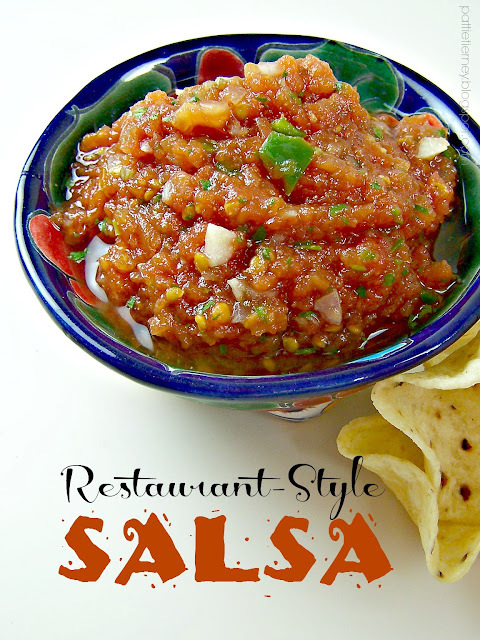 I love salsa and I need to whip up a batch of this recipe by Olla-Podrida. This is the cutest DIY seed packet sign by Scavenger Chic. It's my favorite fruit season and you can find a fresh peach ice cream recipe by Mimi Mine. 1. You must have a link or my button in your post to be featured. No link, no feature. 2. Please don't link something you already linked. New content only. 3. No advertising including shops and etsy shops . 4. No link parties, please. 5. By joining this party you give me permission to feature your work , with a link, on my social networks and this blog. Thanks so much for hosting another fun party, Kim!! LOVE that seed packet sign, thanks for having us over, Kim! Great features...been following Pat's journey in downsizing her home and love the seed packet sign too as I have several of the actual vintage Huth Seed Co. packets....wonderful features!....Thanks for hosting!...Have a great week! Thanks so much for the party too ! Kim, so glad you went to Haven for the connections made. I'm sure those made it totally worth your time. Thanks for hosting. Thanks so much for featuring our Den, Kim. We are enjoying it! So happy we made the decision to turn the extra room into a little getaway space. Great features! I'm going to check out that salsa recipe - looks delicious! Thanks for hosting, Kim! I missed Haven again this year...maybe next year for me! I have a lot of blog reading to catch up on though so I am looking forward to hopping over to these features. Thanks for hosting again! I just love that seed packet! Gorgeous! Thanks for the party, have a great week, Kim. Thanks for hosting your lovely party Kim! Have a wonderful week! Thanks so much for the link party and great features! Hope you have a wonderful rest of the week! I'm glad you had fun at Haven and I'll bet it was more relaxing not taking a lot of pictures! Glad you are back. Thanks for the party. Great party, thank you for hosting. That salsa looks perfect, must try! Glad your having fun in GA! Thanks for hosting Kim! Safe travels going home! Hi, Kim, the features are awesome, and I specially love Pat's new house. Thank you for hosting, and have a great week. Kim, I bought fresh peaches at the farmer's market on Saturday. I think I need to make Mimi's ice cream! I love peach season too! Especially a good cobbler. Thanks for hosting, Kim! Thanks for hosting! Awesome features ... I love seeing Pat's beautiful new home, too, and I MUST make some of the yummy salsa! thank you for another awesome party Kim...so nice to see Pat's feature, and peaches and salsa~all summer favorites! Thank you for hosting and for having me once again! Love all the features! I always enjoy your party, Kim. Thank you for hosting. Love the salsa feature --I need to try that recipe out ASAP. Hope you're staying cool! Glad to hear it was a good time in Haven. Thanks for hosting this weekly party! Hi Kim. As always, thanks so much for hosting and for sharing such awesome features. 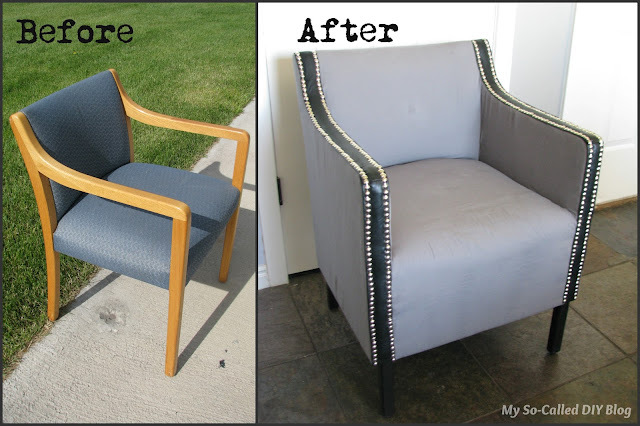 Thanks so much for featuring my waiting room chair makeover!! Wow you have a lot of followers now for your party !